One of the characteristics of concrete is the formation of pores and capillaries that are formed during the hydration phase and that are part of every mass of this material. Pores and capillaries make concrete permeable, allowing the passage of water, which also carries the external chemical agents that over time cause the oxidation of bars and the deterioration of concrete. DPC (Deep Penetrating Capillary) crystalline technology is a waterproofing chemical treatment that, when added to the concrete mix as an additive or used as a coating, increases the durability of concrete by sealing pores, capillaries and micro-fractures with a needle-like crystalline formation that is insoluble and highly resistant. 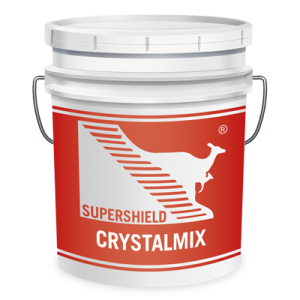 Supershield’s active components react chemically with the co-products of cement hydration, forming a crystalline structure that becomes part of the concrete mass, making it impervious to moisture and liquids entering from every direction, but allowing the passage of water vapour and allowing the structure to breathe. The crystalline structure is established when there is moisture. Also in time, if settlement cracks form, new water trying to enter concrete triggers a new crystal growth process which seals cracks of up to 0.4 mm. The crystalline structures, being formed inside the concrete mass and not exposed to the surface, cannot deteriorate, whereas membranes and other superficial waterproof coatings can easily be damaged. 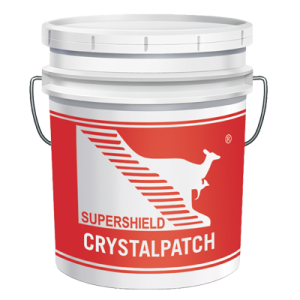 Simply put, the Supershield DPC system waterproofs and protects concrete permanently, therefore increasing its durability. 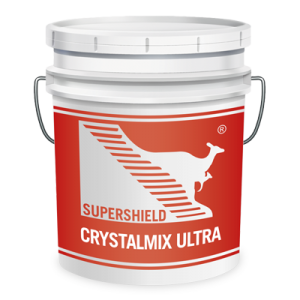 The benefits to using crystalline technology for waterproofing concrete. technologies for waterproofing both new or existing concrete. can be used from both positive and negative sides, compared to the hydrostatic pressure, allowing repairs from the outside, for example, full tanks or reservoirs . repair is permanent, unlike other systems that have a limited or short duration. are self-sealing for cracks of up to 0.4 mm that form even after repair.